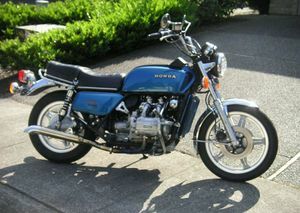 The Honda GL1000 is a motorcycle produced by Honda from 1975 to 1979. 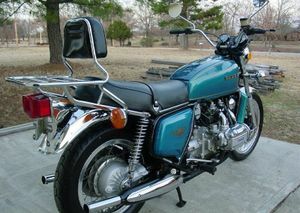 After showing the world what it could do with the CB750 in 1969, Honda was ready to do it again in 1975. 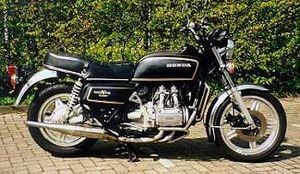 Honda had recently weathered a downturn following the retirement of its founder, Sochiro Honda, but when the GL1000 Gold Wing arrived that year, it had become clear that Honda was a leader (if not "the") in motorcycle technology. 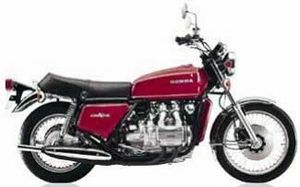 The GL1000 is powered by a water-cooled opposed four (flat four) engine that displaces 999cc. 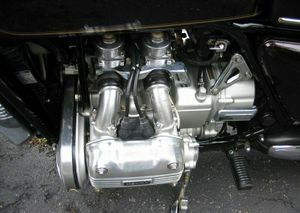 The camshafts of its flat-four engine were driven by cogged belts. 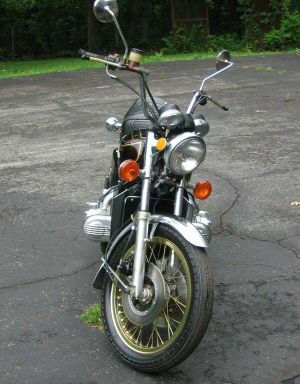 The GL1000 came equipped with shaft drive, as opposed to being chain driven. 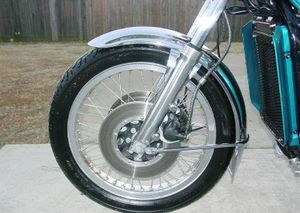 This adds a level of smoothness, reduces maintenance, and avoids the problem of chain oil being slung everywhere. 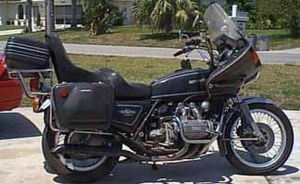 Most motorcycles made (by other companies) up to that point used a gas tank mounted in front of the rider, on top of the "backbone" of the bike. 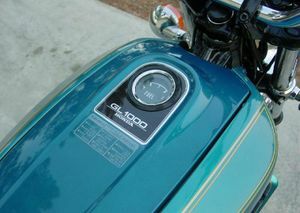 The GL1000 had a "faux" tank, that was nothing more than a cover for the electronics, and a housing for the air filter. 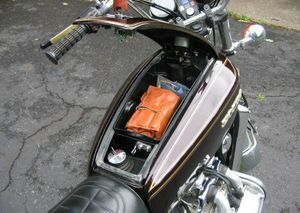 The real tank was located between the two side covers for a lower center of gravity. It was rumored that the project design had been subcontracted to Porsche and that the original prototype had been fitted with an air-cooled flat-six like the famous Porsche 911 car. 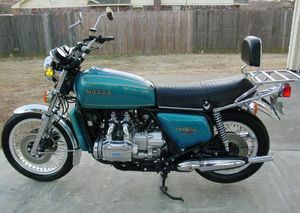 Interestingly enough the Gold Wing would eventually become a flat six with the GL1500. 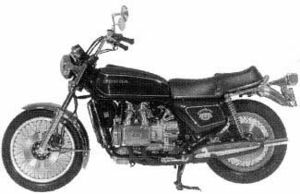 The bare-bones version at 265 kg (584 pounds) was often dressed up with a fairing, saddlebags, luggage rack and box to increase the weight even more. 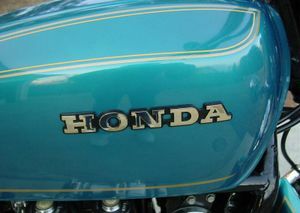 In the first five years of production, Honda sold almost 100,000 copies. 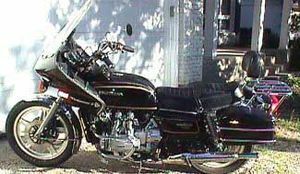 The original Gold Wing has since grown to a 1100cc then 1200cc then 1500cc (six-cylinder) and then 1800cc with a talk of a 2000cc in the future. 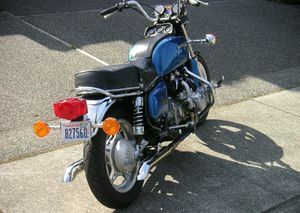 In 1976, Honda sold a limited run of special GL1000s, badged as the GL1000 LTD. 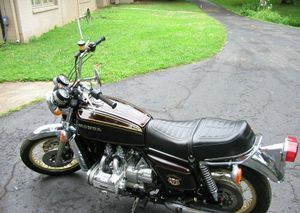 The LTD wasn't any different mechanically from the standard GL1000's. 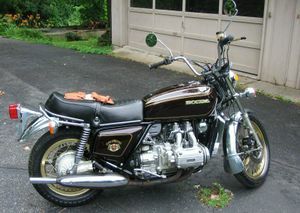 It featured gold pin striping, special LTD side cover badges, a chromed radiator guard and screen, a quilt patterned seat, gold anodized spoked wheels, a gold stamped GL1000 owners manual, and a leather key case. 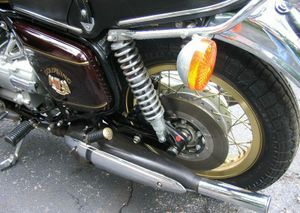 The LTD's fender is also slightly flared. 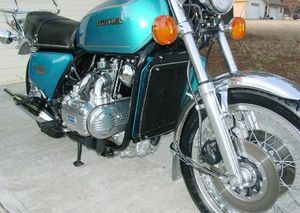 The 1975-1977 GL1000 engines had electric start, with a kick starter as a backup. The kick starter is geared very well, and actually doesn't require "kicking". 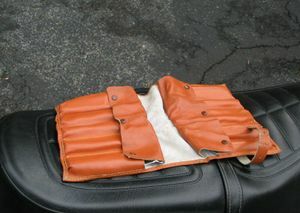 The engine can be started using the "kick start" lever, using one's hand. 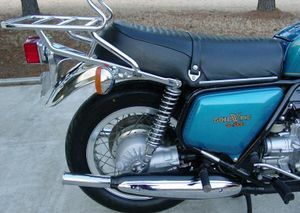 The 1978 model GL1000 added a small instrument panel to the top of the faux gas tank (where there was previously only a fuel gauge). 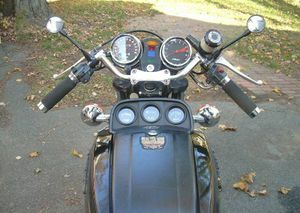 The new gauge cluster included a voltage meter, and coolant temperature (which was previously on the tachometer). 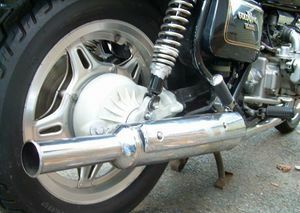 The exhaust was also changed to a chromed pipe with mufflers, as opposed to the "horseshoe" muffler design of the 75-77. 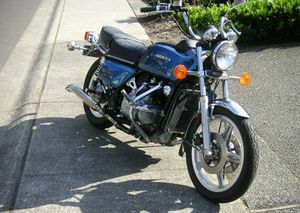 The 1979 model GL1000 has been termed by some as the "ugly duckling" though it is mechanically same to the 1978 model. 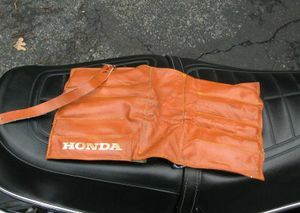 Changes for 1979 were cosmetic. 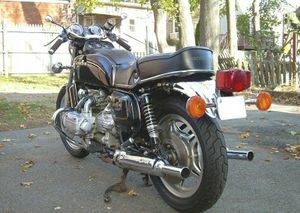 Rectangular turn signals replaced the previous round ones, control levers were changed from silver to black, and twin-bulb taillight with CBX-type ribbed lenses replaced the single-bulb unit. 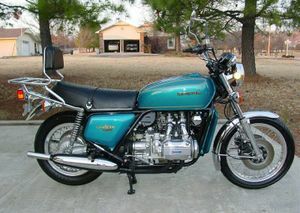 GL1000K0 - The GL1000 Gold Wing was introduced in 1975 with two available colors: Candy Antares Red and Candy Blue Green. 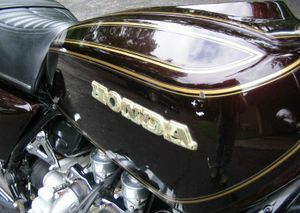 Fairings, common on newer Gold Wings, were an add-on accessory. 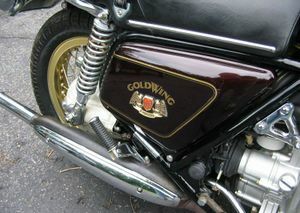 The side cover decal reads "Gold Wing GL1000" The face of the instruments was dark green. 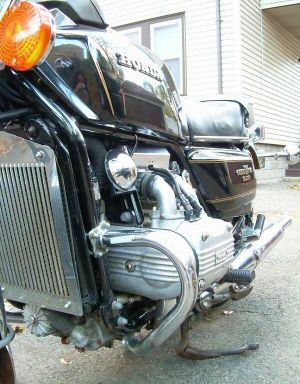 The exhaust system was black with a solid chrome shield and chrome tailpipe. 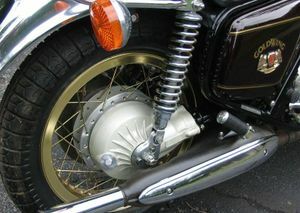 The spoke wheels had aluminum rims. 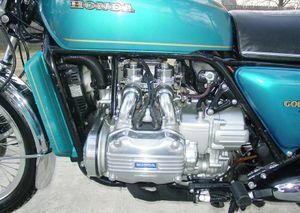 The SOHC engine displaced 999cc and had only two valves per cylinder. 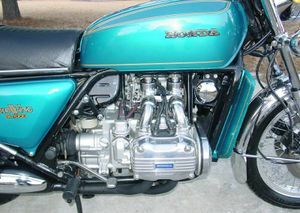 The engine was an opposed four cylinder similar to the BMW. 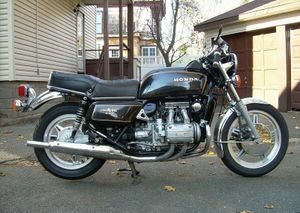 Interestingly, it also duplicated the BMW by incorporating a shaft drive. The transmission was a five-speed. 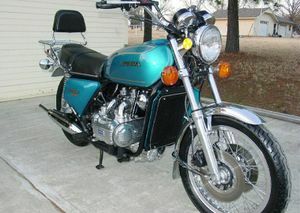 The frame serial number began GL1-1000012 while the engine serial number began GL1E-1000001. 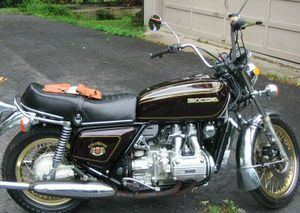 GL1000'76 - The second year for the Gold Wing (GL1000 '76) was introduced in 1976 with two available colors: Candy Antares Red and Sulfur Yellow. 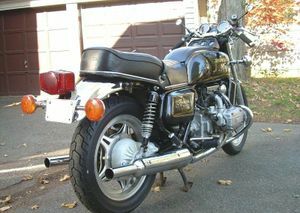 Fairings, common on newer Gold Wings, were an add-on accessory. 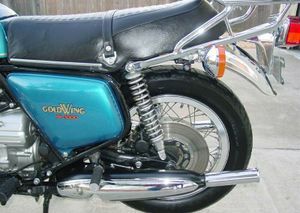 The side cover decal reads "Gold Wing GL1000" The face of the instruments changed to light green. 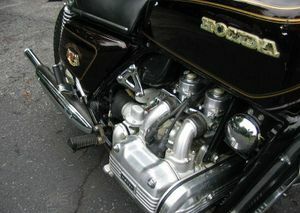 The exhaust system was black with a solid chrome shield and chrome tailpipe. 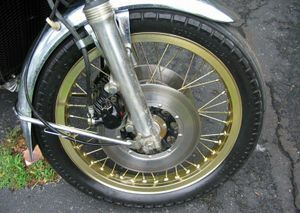 The spoke wheels had aluminum rims. 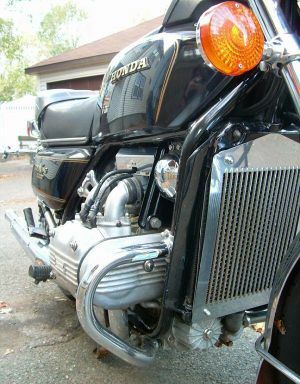 The SOHC engine displaced 999cc and had only two valves per cylinder. 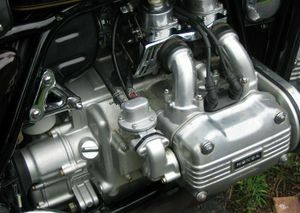 The engine was an opposed four cylinder similar to the BMW. 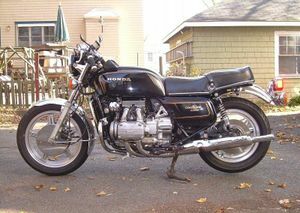 Interestingly, it also duplicated the BMW by incorporating a shaft drive. The transmission was a five-speed. 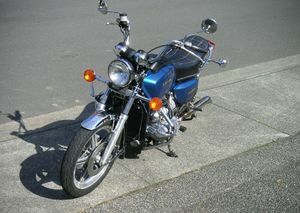 The frame serial number began GL1-2001483 while the engine serial number began GL1E-2001422.